Golden Ruby Games presents Extreme Exorcism, a game whose difficulty increases due to your own actions. Mae Barrons is a ghost hunter exploring a large haunted mansion. The trouble is, the ghosts can copy her actions. So, when you start out, you have only one ghost to fight, and you just need to run over and grab a weapon from a spawner and kill it. But in the second round, the ghost follows your previous movements exactly, even running over and grabbing the weapon. Still, you will have remembered your movements, so this is not terribly difficult… but after several rounds and several ghosts imitating all of your previous movements, things can get pretty crazy. Even more so when you consider that the game offers 4P co-op. 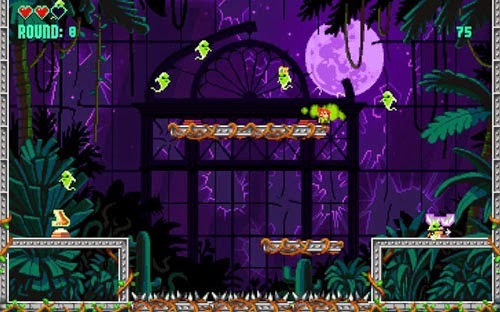 The player has access to more than 20 weapons with which to eliminate the ghosts of their former selves, and you can stack up to three weapons and use them simultaneously. Extreme Exorcism is now available for PC via Steam, PS3 and PS4 via PSN, Xbox One via XBLA, and Wii U via eShop.